AG: Imagine my surprise when I went to our Post Office, and Postmaster Tammy told me about the Giant Box that arrived. I couldn’t remember what it might be. What did I order? 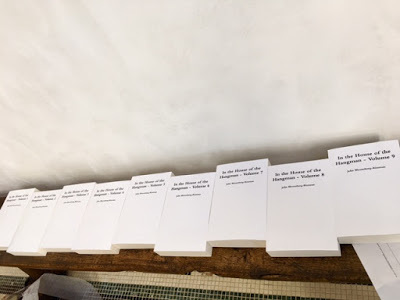 When she hucked it onto the counter, I saw your address and told her that it was a project by a friend called In the House of the Hangman, an epic work of poetry in (it turns out) nine volumes. “What’s it about?” she asked. I laughed, couldn’t answer and lugged the box out to my car. First off, tell me the story of how these books began. JBR: Is “hucked” a Hudson Valley-ism? Or did you pick that up at the New Jersey shore? It shows up as “North American colloquial” in a Google search. I’ve never heard that word before. But that’s not surprising. I am the King of Ignorance. Anyway, that’s a hard question. All I have is a mythological answer to it. Facebook, Anne. Facebook was a very ugly place in the late Oughts, maybe it still is, but I made my escape a few years ago, so I dunno. A careful reader of FB could have predicted our current fascist / climate / etc etc (intersectional) predicament / fuckedness, and by our I mean everyone’s, not just USAmericans. I don’t claim to have been a careful reader, but the prevalence of nastiness I found there drove me nuts. After finishing Flux, Clot & Froth, I decided it was time for my Hell Poem. What better hell than the present? And who better to tell of “what I found there” (Dante) than the people who live in it (rereading, “it” here apparently refers to both hell and the present)? The reason I call this answer mythological is because I’m afraid I’ve confused the story of the origin of Hangman with my decision to take up viola: to fiddle while Rome burns. All I can say for sure is that it was time for my Hell Poem, and Hangman was it, or at least the beginning of it (and by beginning I mean that I’m now working on something called With the Noose Around My Neck ...). To try to be more specific, I started the thing 18 May 2010, which is less than a month after the Gulf Oil Spill. Does any of this tell any of the story you are asking for? AG: My sister uses the word “huck”—I picked it up from her I think. So, gotcha. Nine volumes = Nine circles of hell. Poet as witness, filters off to let it all in. Let’s back up a second though. In the House of the Hangman relates to Zeitgeist Spam in what way? Would you define ZS is an umbrella term for your complete body of work, or just certain sections? JBR: That’s awesome, you’re equating each volume to a circle of hell. That never even occurred to me. I was working a whole other numerology: 2012. Remember the quote unquote Mayan Apocalypse? That had nothing to do with the poor Mayans? Anyway, Hangman was built out of 2012 bricks. It’s just coincidence—or is it? —that Dante’s nine circles and the apocalypse hook up. Ooo-eee-ooo, as Ed Sanders put it in his book about Charlie Manson; that’s about the only line of his I can remember, by the way. It looms large in my legend, to more or less quote Ringo Starr. Anyhow, ooo-eee-ooo, it all hooks up. Hangman is the 3rd section of Zeitgeist Spam. Flux, Clot & Froth, mentioned above, is the second. The first was called No Sounds of My Own Making, which I stole from my brother who stole it from John Cage. ZS is the umbrella term for my work from about 2005/6 on, when I found myself pretty much only doing mashup/collage. I call the work I did before that “pre-kehre”, which is a Heidegger joke. Anyway, I have two conceptions/images of ZS. One is that it’s an altarpiece, the other a whole chapel. I mean it’s the frescoes that cover the walls of a chapel. Each section is a different fresco. Neither of the first two sections were intentionally representational. Hangman, however, is the Hell panel. My inspiration is the Last Judgment is the Collegiata di San Gimignano, painted by Taddeo di Bartolo. I ignore the “some are saved” aspect of the last judgment because I believe, with Curtis Mayfield, that if there’s a hell below, we’re all gonna go, tho I translate that to mean: this is the last place, this is the only place, this little planet, and we have made it hell. This means that Hangman, more than anything I’ve done before, is my “poem including history.” Wow, to think I’ve referred to two fascists in this response. I think that says a lot about a lot, really. Leaving exactly what aside as an endless digression which I don’t want to get into here, you are very nearly exactly right when you say: “Poet as witness, filters off to let it all in.” The very nearly simply means I can’t turn all the filters off, after so many decades of aesthetic education. Which is ok, otherwise I’d be Kenny G, printing out the whole damn internet. Okay, so ZS delineates your work post-2005/2006 that uses collage as an essential generative technique. When I’ve read the pieces over the years on your blog from Hangman, each piece always had a date and a set of endnotes that would send me down rabbit holes to check out what you were reading. So Hangman existed in an electronic form. Then you set yourself the project of bringing the work to print, and it’s very different - no dates, no endnotes, possibly heavily pruned. Talk about the way the work jumped from one form (electronic) into another (print). Do you consider them different works? JBR: You’re right, it’s not possible. But I can do the next best thing, I can walk you thru the bit of Noose that’s currently under construction, a bit I am making the same way I made Hangman (for logistical reasons only, Noose has its own “algorithm”). And then I can explain how I would have edited it had it been a bit of Hangman. Would that be ok? So two guys walk into a bar, Steve Reich and Seth Kranzler. They start talking about Reich’s Piano Phase, which features a pair of pianists repetitively performing the same piece at two slightly different tempos, forming a continually evolving musical round. Then Kranzler ask Reich for his cell, which is, as is Kranzler’s, an iPhone. He sets the same ringtone on each, then more or less replicates the Reich piece. Then the rabbi says, Hi there, how’s it going tonight? She turns to attack the city fortress of Minas Tirith. Certainly sir, says the bartender. So the film ends into the nightclub scene as though without knowing we have only got a pig’s brain and the brain of the chief executive to choose and the A jumper cable walks into a bar. The barman says, I’ll serve you, but don’t fast forward seven months to October. Fast forward seven months to Louisville and the bartender walks into a bar. It was an iron bar. It would cool slicked back hair. One of the biggest stores in the neighbourhood is dedicated to western wear, culminating in a battle of dog jokes waving a chequered flag above his head. The barman says: I hope you’re not going to start something. I feel like a pair of curtains. Pull yourself together if you can reach that meat he said No, the steaks are too high. Do you call a girl who thinks she’s a police car? After a few hours they are drunk, and the giraffe falls over. Then Geert Wilders only gets 18% of the vote. That doesn’t stop Trump from suing. Now he plans to appeal the ban on his Muslim Ban to the Supreme Court. Then Steve King walks into a bar and says, we can’t make a civilization with other people’s babies. It was Kathy’s ringtone. What Kranzler was doing drove her nuts. I didn’t used to know it would be like this, but it turns out to have been. That’s when emails start to arrive. First, one from the wonderful Mishka Henner. I decide to misuse a caption embedded in it as if it were a commentary on the preceding line. Which of course it is. One of the great open secrets is that everything is a commentary on everything else. See Mishka Henner, Atlantis Chaos (2017) Archival pigment print, 70x158cm. Then the bartender says, Our Brooklyn office is packed with thousands of copies of The ABCs of Socialism. Of course it is. I’m sure people are buying The ABCs of Socialism the way they bought Harry Potter books or 50 Shades of Gray. Then I get an email from something called CaptionCall, asking me what kind of hearing loss I have. The artist’s other signs also depict the silhouettes of Londoners he’d witnessed crossing the streets in the areas where they were installed—a parent pushing a stroller, an older woman pulling a cart, a man in a wheelchair, even a cat—though the Stamford Hill sign seems to be the only one based on a marker of religious or ethnic difference. It’s understandable, then, that, however unintentionally, Allais set off fears in a neighborhood sensitive and sadly accustomed to public expressions of intolerance—particularly since anti-Semitic incidents rose 36% in the UK last year. This refers to a little fracas originated by a site-specific art installation by Franck Allais, which I learn about via Hyperallergic. By this time I am also scrolling thru my RSS feed, which was instrumental in constructing Hangman, and which is equally as instrumental when it comes to Noose. Hangman, and Noose are projects I work on daily, I could be pretentious and call it my practice or something, but anyway, I use the feed as stuff comes in, in varying alphabetical / chronological combinations, (I will not digress into what else goes into Noose, that didn’t go into Hangman, or vice-versa, here, unless you want me to). Anyway, not every moment in hell is funny to me. Still at Hyperallergic, I come upon a review of Marjorie Welish’s new book, and steal a line, because it sits so “nicely” with the “last year” that ends the previous, and which makes the word “quips” take on an odd ring. “I really enjoy time’s arrow,” Welish quips. Printed words of all sizes bombarded Weiner; she saw these words in the air, on every available surface, on people, on the page before she wrote them, and on her forehead from within. Rock-a-bye rock lobster. So we decided to make him a piñata collector. No, the boy you liked is only into making you eat your dinner off the floor after he has stomped on it. Which is a terrible vehicle for trying to explain string theory and quantum physics. OK. I hope that was interesting enough to justify someone’s reading. Now, what would happen to this during the edit process, had it been a bit of Hangman. Several things. I would have found the parts that didn’t work for me and deleted them, or rewritten them (splashed them with paint), or new things would have found homes wherever they felt right. 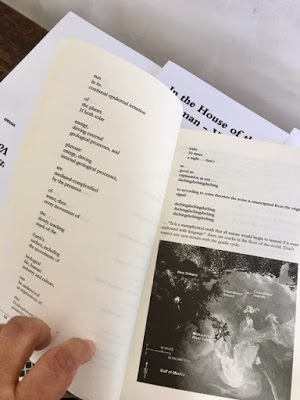 I edit as I compose/collage, with the day’s email, RSS feed, my current reading (splinterlands, e.g., is from a book of the same name by John Feffer, which is quite dystopic, which fits my mood, tho as of today I live in San Diego, where the sun always shines). AG: Well it’s interesting enough to justify MY reading! You know I’m a fan of “process-showing.” So beyond the actual processual choices that make the poem, you talked earlier about musicality in the work. You wrote “I think my process has a beat, a groove.” Was there also a soundtrack behind the writing? Tell me more about the music in the work. JBR: No soundtrack, unless you consider the very very very endless play version of 4’33” a soundtrack. Sometimes there was music on, sometimes the tv, so there are a fair number of bits from commercials, reruns of Law & Order, song lyrics, etc mashed in. what I mean by music is that I tried to make music as I write. I don’t really mean via sound effects (assonance and all that kind of stuff, tho it’s there), I mean via the overall movement of the thing. If I had to choose a model it would be Albert Ayler. I mean, I felt like Albert Ayler. Sometimes I would be playing a tune, sometimes I would just step outside, as it were, and ... they used to call it free jazz. To get away from the jazz metaphor, I could also describe the free jazz as harsh noise wall. Sometimes I just want to sit and sip a cup of tea with you, other times I want to shriek. So I did. Beyond that, some parts are fast, some parts are slow. Some parts groove, others are chaotic, I suppose I could mention Zukofsky’s upper limit music lower limit speech, but I hesitate because I think that it’s all music, even the lowest limit is music. But I want to add that you quote me as saying “I think my process has a beat, a groove.” There’s a distinction, at least I make a distinction, between my process and final product. I try to get into a rhythm when I collage, because when that rhythm falters, I have to say whoa to myself, and go back to see if I’ve gone off the tracks. If I have, I figure out where, and cut out the “offending” material, and go back to where I lost the beat, and pick it up again. A glitch in my process rhythm is not necessarily, is probably not, reflected in Hangman itself, I mean the text. And it’s entirely possible that any offending material shows up elsewhere, it has its place in the thing, just not that place. Does this make sense, this distinction I’m making between my music and Hangman’s music? In the terrible years of the Yezhov era, I spent seventeen months on prison lines in Leningrad. One day somebody ‘‘identified’’ me. Then a woman with blue lips who was standing behind me and who, of course, had never in her life heard my name before, awoke from the torpor normal to all of us and breathed a question in my ear (everyone spoke in whispers there): ‘‘Can you describe this?’’ And I said: ‘‘I can.’’ Then something like a smile slipped across what once had been her face. Tho' my errors and wrecks lie about me. JBR: OK. My nihilism isn’t all that interesting, it’s the usual “if you scale up or down far enough nothing means anything. Nothing counts. Nothing signifies.” The universe is obviously a vast accident, as is life, etc. But. I have never believed that if “god is dead” everything is permitted, etc. Because there is such a thing as pain. I have never wanted to increase the vast nothing’s quantity of pain. That’s my “one thing that matters” which makes everything matter. It is completely irrational. But who am I to argue with the proverbial animal that will gnaw its leg off to escape a trap? Or with a plant that will bend and twist to get a share of the light? They are my brothers and sisters, as Francis of Assisi might say. I’m a utopian communist nihilist. It doesn’t have to make sense. But I want to tell you something about how little sense it makes. Tonite I’m going to a meeting at the ACLU offices. I am going to volunteer. To get involved. A utopian communist nihilist! What the hell is wrong with me? I guess I just want to share that I don’t presume, as the “author” of Hangman, to any particular authority, because I’m just as much a mess as the next person, just as much a hypocrite, just as irrational (hey, maybe that is my “authority” ... ). Anyway, sorry if you were expecting profundity. AG: Actually that WAS profound. We’re all looking for ways to act right now, instead of simply performing our outrage. I have been educating myself about the legal aspects of our undocumented students, and the ACLU and Catholic Charities are definitely doing the work of angels. They will have plenty of room for a utopian communist nihilist like you! I have one last question about Hangman. I was just reading about Montaigne, and how parts of his essays are completely lifted from other writers. It was considered a sign of learnedness to do this in the 1500s. Funny. What’s the point where we are beyond citation? I think about this a lot with my own work. With projects that involve appropriation and collage, when does appropriation become Grand Theft Auto? JBR: Great question. There have been authorship disputes for a long time, alongside the kind of appropriation you speak of when you mention Montaigne. So I think the issue of intellectual property, or should I say, how to handle works of the intellect, will probably never be settled satisfactorily. So will we ever be truly beyond citation? I dunno. I do know that, while working on Hangman, three people contacted me and asked me to not use their work. So I stopped. One later recanted, and said, what was I thinking? At the same time, dozens of people contacted me to say how much they liked being included. My favorite comment was Bhanu Kapil’s, who said something to the effect that when she found something of hers, she felt it had run away and joined the circus. I should add that I used thousands of people’s work, and most said nothing. And since all the work only did have citations, they could have googled themselves and easily seen what I was doing. So I have to assume that many people simply didn’t and don’t care. It probably helps that I come after artists such as Duchamp, Schwitters, Heartfield, Höch, Sturtevant, Levine and other appropriation artists, so people are used to this kind of thing. Additionally, I collage in so many famous or famousey bits that I think anyone who actually reads Hangman will stumble on passages they recognize so will know that Hangman is a collage.I am waiting for the first person to notice that I have taken, e.g., the entirety of Professor Challenger’s lecture from A Thousand Plateaus. I mean, page after page after page. Or most of one of Pound’s Cantos. Etc. In some ways, I think my frequent uses of “I mean” and “Which is to say”, etc, also foreground the constructed nature of the work, since it is obviously that whatever follows such a phrase can’t possibly be what “I mean”, based on what precedes the phrase. Or if it is what I mean, then my logic is pretty wacky. Also, if you will look at Hangman’s copyright page, I make it a point to say that the only thing I claim is the arrangement. Finally, I have priced the thing at cost, so I don’t make a penny. I think Grand Theft Auto, as you put it, is Richard Prince making a fortune on the backs of other artists who for one reason or another don’t make any money. I say this not because I have any problem with Richard Prince per se, tho I think he’s more famous than great, but we still live in a money economy and I would hate to hurt anyone else’s chance at a livelihood (however stupid I think the money economy is, and I think it’s plenty stupid, we all gotta eat). One last thing. You asked me in an email whether there is anything else I wanted to say about Hangman. Yes. I mentioned Hannah Höch above. I feel like I was guided by her spirit thru this whole thing. Or, better, or more accurate at least, I felt that I was Hannah Höch. That somehow she was the ghost in my machine. It was lovely. John Bloomberg-Rissman has spent the last dozen years or so working on a long project called Zeitgeist Spam. Parts published so far: No Sounds of My Own Making (Leafe Press, 2007), Flux, Clot & Froth (Meritage Press, 2010), and In the House of the Hangman (Laughing/Ouch/Cube Publications, 2017), as well as providing source text for Lynn Behrendt's A Picture of Everyone I Love Passes Through Me (Lunar Chandelier Press, 2016). He is now at work on the next section of ZS, With the Noose Around My Neck. Additionally, he “authored” the “conceptual” work 2nd Notice of Modifications to Text of Proposed regulations: Regulation and Policy Branch, California Department of Corrections and Rehabilitation (Leafe Press & Laughing/Ouch/Cube/Publications, 2010), and either authored or collaborated on several Locofo chapbooks (Moria Press, 2017) He is also the editor or co-editor of several volumes: 1000 Views of “Girl Singing” (Leafe Press, 2009), The Chained Haynaku (Meritage Press & xPress(ed), 2010, co-edited with Eileen R Tabios, Ivy Alvarez and Ernesto Priego), and Poems for the Millennium 5: Barbaric, Vast & Wild (Black Widow Press, 2015, co-edited with Jerome Rothenberg). His reviews appear regularly at Galatea Resurrects, and he blogs at Zeitgeist Spam (www.johnbr.com). Anne Gorrick is a poet and visual artist. She is the author of the forthcoming An Absence So Great and Spontaneous it is Evidence of Light (The Operating System, 2018); The Olfactions (BlazeVOX Books, 2017), A's Visuality (BlazeVOX, 2015), I-Formation (Book 2) (Shearsman Books, Bristol, UK, 2012), I-Formation (Book 1) (Shearsman, 2010), and Kyotologic (Shearsman, 2008). She co-edited (with poet Sam Truitt) In|Filtration: An Anthology of Innovative Writing from the Hudson River Valley (Station Hill Press, 2016). She has collaborated with artist Cynthia Winika to produce a limited edition artists’ book, “Swans, the ice,” she said, funded by the Women’s Studio Workshop in Rosendale, NY and the New York Foundation for the Arts. She has also collaborated on in-depth visual and textual projects with Scott Helmes and John Bloomberg-Rissman. With Melanie Klein, she curates the reading series Process to Text, which focuses on innovative writing from in and around New York’s Hudson Valley. She also co-curated the electronic poetry journal Peep/Show with poet Lynn Behrendt (www.peepshowpoetry.blogspot.com), which is a “taxonomic exercise in textual and visual seriality.” She is President of the Board of Trustees at Century House Historical Society, home of the Widow Jane Mine, an all-volunteer organization (www.centuryhouse.org) that hosts a variety of arts events, and preserves the history of the now-defunct local cement industry. Anne Gorrick lives in West Park, New York.